Cut the meat into 2-3 inch chunks. Place them in a large pot with 16 cups of water, add salt and garlic cloves, and bring to a boil. Cover the pot and let cook for 30 minutes, skim off the foam that forms at the top. Reduce heat to low and cook until the meat is tender (about 2 hours). Boil the dried peppers in a pot with 4 cups of water. Remove from heat and let them soak in the water until completely rehydrated. Blend the peppers and the water where they cooked along with the flour, oregano and ground cumin. Pour the blended pepper mixture into the pot with the meat. Carefully add the corn and sweet potatoes. Cover the pot and let cook on low heat for 30 minutes until the sweet potato is tender; adjust salt seasoning if needed. Remove from heat and let cool for 10 minutes before serving. Serve in large bowls and garnish with lemon and radish slices, chopped onion and cilantro. Serve with tortilla chips. Enjoy! Save half of the pozole and let cool completely. Save it in a sealable container and freeze to enjoy it later. 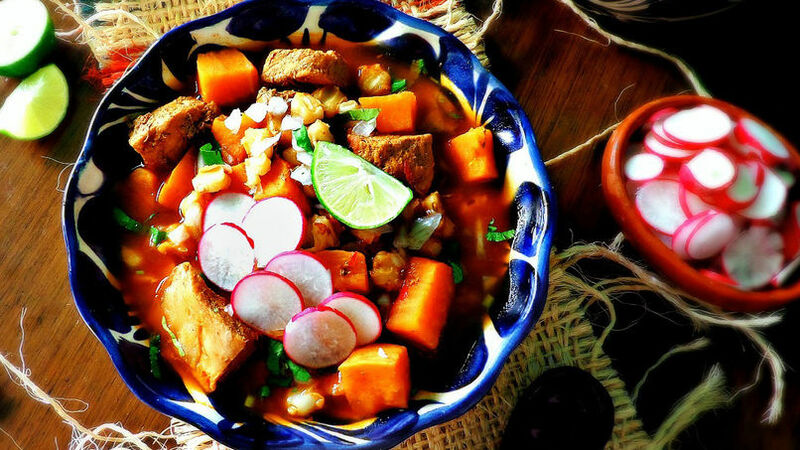 Pozole is a traditional Mexican dish that is always present during Posadas and today I bring you a super delicious recipe. Nobody can resist a delicious cup of this pozole made with tender chunks of pork meat, white corn and a seasoned broth made with three varieties of dried chili peppers, oregano and cumin. To give it a special seasonal touch, we’re adding colorful pieces of sweet potato. The natural sweetness of the sweet potato combines perfectly with the smoky flavor of the dried peppers. As my grandpa would say, it’s a broth that feeds the soul! Try it for yourself and make it for your family this holiday season.